Just last week, history was made when Donald Trump and KimJong Un met behind closed doors at the US/DPRK Summit hosted in Singapore. The Summit itself took place on Sentosa Island which is the largest offshore island in Singapore. Singapore, land of the merlion, gains it's name from the Sanskrit word santosha, meaning peace. As a result, the city-state of Singapore's resort island Sentosa was an ideal location to host the US/DPRK Summit. There was a palpable sense of excitement in the air and despite what so much of the Western media may have reported, most everyone we met and spoke with was excited about the prospect of peace and the reunification of the Koreas. Speaking of Western media, we discovered that it's actually far easier to find peacocks and komodo dragons than it is to find US-based journalists. This is especially interesting considering the US and Japan were two of the top countries to apply to the Singapore Ministry of Communications for official accreditation. My editor in chief Major Burdock walked through the long corridors of the Media Center International site and a good 3/4 of the media floor was empty. We recorded a segment involving me walking the quarter to half mile of near empty corridors of the Media Centre International but unfortunately, we had our video feed cut out, but the audio is still all intact. 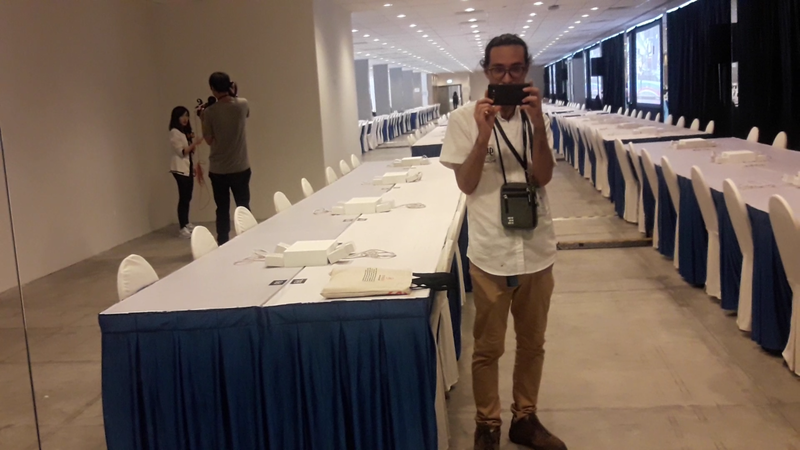 The Singaporean government had diligently prepared the Centre for probably twice the estimated turn out of 2,500 or so reporters. Waiters, locals, hotel clerks, tourists, even the bartenders at the Shangri-La (the hotel where Trump slept the night before the meeting with Kim Jong Un) were met with our questions about what they thought about this event and, of course, if they had seen any American journalists (especially CNN). Massive amounts of work went into making this Summit happen. Singapore only needed a short 2-week span to arrange all the logistics between American and North Korean delegations and the international media of which some 40+ nations were on hand according to MCI themselves. The facilities were incredibly nice by the way. Food and refreshments were provided hailing from multiple ethnicities. There was even free halal breakfast offered (which, considering the fact that we were right in the midst of late Ramadan) just seemed sort of like a cruel joke to hold over practicing Muslim reporters' heads. Burdock and I even had a couple half pints of Bourbon and Bailey's flavored alcoholic ice cream from <a href="http://www.udders.com.sg>Udders Ice Cream</a> (don't worry, at 3.8% we were nowhere near in danger of getting anywhere near intoxicated). A big thanks to the folks at Udders by the way. In between the hilarious marketing featuring the iconic hair of Kim and Trump and the incredible friendliness of the folks themselves, I had to mention them. One thing that was immediately noticeable was the fact that 85% or more of those at the event were Asian. A smattering of Westerners, many of them Russian, French, Australian were milling about, but we didn't find the first American reporter outside of each other and the mirror. The MCI featured "assigned seats" for some of the press who had signed up. Once again, we noted the names of the assigned workstation. We even kept an eye on those scores of empty chairs assigned to outlets not on hand, but saw no mention of CNN, Fox News or any major American papers (apart, of course, from Voice of America, but they're more a global propaganda network <i>for</i> America than an network <i>for</i> Americans). Another thing that struck me was the amount of support for Trump we found amongst locals and tourists. While picking up a newspaper in the Changi airport on our way out of Singapore I noticed the cover of the Economist proclaiming "KimJong Won." I asked the Singaporean lady at the counter, Talika I believe it was, what she thought of that. "Oh, it's just the American media. They're biased." I started to explain that I am American and technically a member of the media, she blanched for a minute and looked down until I explained that I was with her 100%. I was really taken aback by the number of foreigners, locals, reporters and natives who were far more optimistic about this Summit than the Western media (American in particular). To be fair, it's easy for Americans to not care about the madman across the world compared to the folks with a madman next door. that is a pretty empty hallway there. reminds me of the shining for some reason.